When gauging whether or not legislation may have a chance of advancing through Congress or the State Legislature, a telltale sign is the level of staff activity happening behind the scenes. 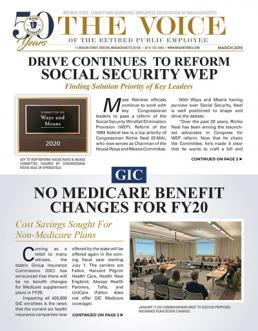 This spring brought a distinct uptick in activity surrounding the proposal to reform the Social Security Windfall Elimination Provision (WEP) from a widespread network of organizations advocating for reform. Most importantly, the work was not limited to WEP reform advocates. During its debate on the FY19 State Budget, the Senate has voted to increase the hourly limit placed on retirees who return to part-time public service for a state or local entity in Massachusetts. Senators Michael Rodrigues (D-Westport) and Paul Feeney (D-Foxboro) cosponsored the measure as a floor amendment to the budget.